Once students have completed the empty-handed forms of Black Sash, they will begin to learn the staff in Red Sash. Students will begin to learn three new weapons after attaining Brown Sash. The long rod dates from at least the period of Huang Di and probably earlier. This is usually the first weapon you learn in any martial art style, and it is the first weapon learned in Praying Mantis - Long Fist. 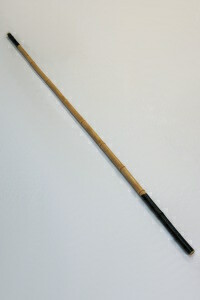 The spear evolved early in Chinese history. 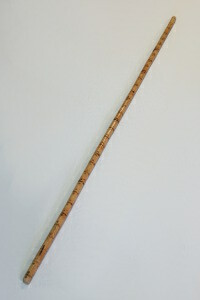 There are many different types of spear heads but the willow leaf blade is the most common in modern schools. There are many types of saber in different geographic areas. 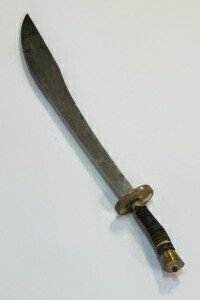 Many similar sabers were created such as the "Cave Saber" which looks like the Japanese katana used by the samurai. The katana's precursor was imported to Japan from China during the Chinese Song Dynasty (960 AD - 1280 AD). This was called the chopping horse saber. This weapon is usually made of bamboo or a solid piece of wood, but during the Chinese Spring & Autumn period (722 BC - 484 BC) and the Warring States period (403 BC - 222 BC), the material was changed to metal. 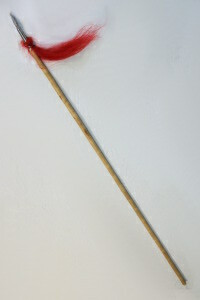 This weapon was used when riding in chariots, on horseback, or during ground battle. Later, it was used to clear a path for the King or Emperor.